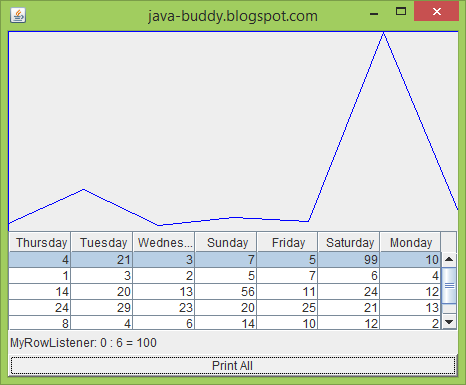 It's a simple example to display data in JTable in a line-chart, by combining example of "JTable" and "JComponent". To make it simple, only the first row will be shown on chart. The second; How do I make a form (or SWING APPI) to generate the Ireport entering the information in (textfieldes or combobox), I am beginner so the difficulties but I'm struggling, thank you in, and congratulations tutorial.